President Donald Trump has promised the highest level of sanctions on Iran after announcing that US is leaving the nuclear deal. He promised Tehran "bigger problems than it has ever had before" if it develops nuclear weapons. 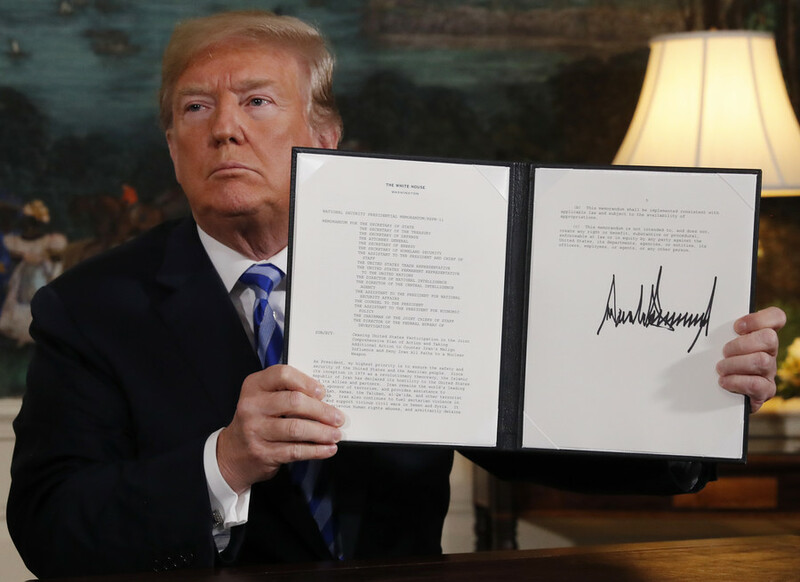 Trump called the agreement a “decaying and rotten structure… defective at its core,” which did little to limit Iran’s nuclear enrichment and provided the government in Tehran with cash to fund its “malign behavior” across the Middle East. Powerful US sanctions against Iran will go into full effect, Trump said, and any country that aids Tehran’s nuclear or missile programs will find itself sanctioned as well. If Iran continues developing nuclear weapons, “it will have bigger problems than it has ever had before,” the US president said. Trump professed admiration for the Iranian people, history and culture, but denounced the “dictatorship” that has held the country “hostage” for almost 40 years - a reference to the 1979 Islamic revolution that overthrew the US-backed monarchy. The revolutionaries stormed the US embassy in Tehran and held fifty two Americans hostage for over a year. “There has been enough suffering, death and destruction. Let it end now,” he said, before signing the presidential memorandum withdrawing the US from the JCPOA. US sanctions will be reimposed over the next three to six months, the Treasury Department said following Trump’s announcement. Iran will be barred from buying or acquiring US dollars after 90 days. After that, sanctions will also be reimposed on sales of steel and coal, aluminum, the automotive sector, and passenger aircraft parts and services. Financial and oil-related sanctions will be back in place after 180 days.